This one is more prevalent than you think. OK, I really don't presume to know what you think, but I've found it's more prevalent than I thought. Here's the deal. You're holding down a chord, and some of the notes just seem to buzz a little. If you isolate that buzzing note and finger it by itself, there's no buzz. 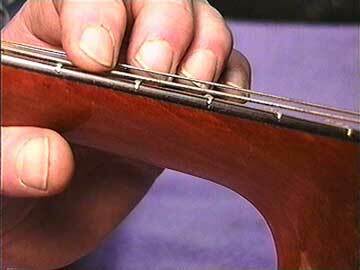 Go back to the chord and you can't quite hold it down strongly enough. This is a real problem for novice guitarists who aren't sure whether it's them or their guitar that's causing the trouble. I've spoken to lots of musicians who presumed they needed to have the action raised to avoid buzzing, only to find that they can't hold the strings down in the first place. The strings are high and stretchy, and I can't quite get my fingers all in the most ideal position in relation to the frets. As a result, I get a light "attack buzz" when I play. Some of this problem is "operator error" and some of it is the height of the strings. I'll have to try lower action to see if that helps. A really good tip-off is to check the action at the twelfth fret. If it's above standard height, then it's probable that the buzzing is from high action.